Members of the CSUN Men’s Volleyball team were able to reach the highest heights at the orange pick in April 2016. Photo David J. Hawkins. The public is invited to join members of California State University, Northridge’s Institute for Sustainability and the local nonprofit Food Forward on Saturday, July 29, in the harvesting of fruit in CSUN’s historic orange grove to be distributed to local hunger-relief agencies. 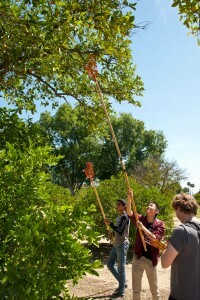 The harvesting of citrus from CSUN’s grove — one of the last original orange groves that covered the San Fernando Valley during its early days — is scheduled to take place from 8 to 10 a.m. in the groves located at the south end of the campus at 18111 Nordhoff St., near Lindley Avenue. CSUN’s Institute for Sustainability has partnered with Food Forward for the past seven years to host the orange picks and ensure that the fruit does not go to waste. Last April, more than 400 volunteers spent four hours harvesting more than 12,785 pounds of oranges. The fruit were turned over to organizations working with the needy, including the Valley-based Meet Every Need with Dignity (MEND), SOVA/Jewish Family Services of Los Angeles, Family Rescue Center and Seeds of Hope. The orange pick later this month is expected to be a smaller harvest, with 100 to 150 volunteers. Anyone interested in volunteering can do so at the Food Forward website, https://foodforward.org/volunteer/sign-up-to-volunteer. Volunteers should be comfortable picking and carrying boxes of fruit. Equipment will be provided. Anyone 5 years old and older may volunteer, but those under 16 years of age must be accompanied by an adult.